With the exception of China, the nation for which the Society originally received its charter, the Philippines was the first Asian country where the Columbans established a mission. 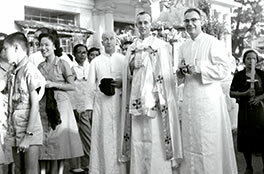 By 2004, the Columban Fathers had maintained their presence continuously in the Philippines for 75 years. In this Southeast Asian archipelago nation, they’d endured warfare, martyrdom, natural disasters and harsh economic conditions to achieve great success and prominence. The June/July 2004 issue of Columban Mission magazine commemorated the 75th anniversary of the Columbans in the Philippines. The articles in this issue highlighted the Columban triumphs, hardships and charitable work there, including economic projects, and work with indigenous peoples, people with substance abuse problems, and people with disabilities. The issue also included profiles of organizations such as PREDA, the People’s Recovery, Empowerment Development Assistance Foundation, and the recently-deceased Columban Father Niall O’Brien. As Columban Mission took a moment to celebrate the 75-year history there, the Columbans continued their work in the Philippines unabated.